Learn why it is good idea to print at least once a week when you have a printer with continuous ink adaptation. A printer with ink system can be a double-edged sword, if we know some tricks to use, including the frequency of printing, it is convenient to print consistently on printers with this type of adaptation to prevent heads ink clogging. The printing frequency should be increased even without depending on what the printer, for example Brother printers, one of these printers with ink system works perfectly provided they are regularly printed, however, if we print this printer for a long time, heads simply the biggest disadvantage of the Brother printers clog is that when the head is damaged is the same as the printer completes damaged. 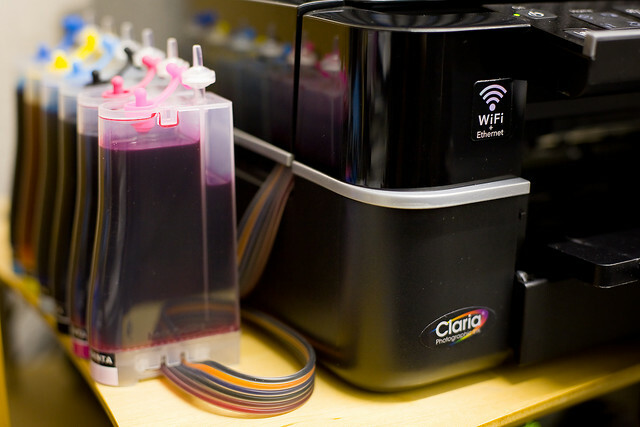 A Canon's most frequented by adapting ink system printer is recommended to print at least three times a week, unlike Brother or Epson printers, is not that hurt him last that long without printing, but it there is the possibility of changing the ink cartridge and this being replaced by another. Certainly less painful than losing the printer completely In order to this publication seek to clarify the need to print at least three pages a week when using a printer with continuous ink system, it is not an obligation but if it helps keep injectors printer working perfectly which helps print quality largely. When you verify this type of printing you are printing all colors, know that this is for all the colors of the cartridge, it may help if you use our publication canon printer head cleaning performed on Canon printers.